Collection of my grayscale colouring pages. They're based on my detailed graphite drawings. 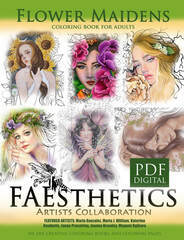 Featuring 4 designs each of 6 artists - Mayumi Ogihara, Janna Prosvirina, Maria J. William, Katerina Koukiotis, Maria Gonzalez, and Joanna Bromley. Collection of my portrait sketches in greyscale for you to colour. Collection of my line art colouring pages. Collection of my grayscale colouring pages. Featuring 5 designs each of 5 artists - Mayumi Ogihara, Janna Prosvirina, Maria J. William, Katerina Koukiotis, and Maria Gonzalez.